Boehner Re-Elected Speaker Of The House : The Two-Way The Ohio Republican will again hold the top post in the House. He challenged House members Thursday to come to their jobs humbled. "If you have come here to see your name in lights or to pass off political victory as some accomplishment, you have come to the wrong place," Boehner said. Rep. John Boehner of Ohio, who has come under criticism from some conservative members of his Republican caucus for — in their opinions — conceding too much in negotiations with the White House, was reelected Thursday as speaker of the House. The speaker, known for showing his emotions, later choked up several times during a mid-afternoon address to the House. He challenged members to "do the right thing" and come to their jobs "humbled." "If you have come here to see your name in lights or to pass off political victory as some accomplishment, you have come to the wrong place," Boehner said. "The door is right behind you," he added, pointing to the rear of the chamber. The Ohio Republican needed the support of at least 214 House members (there were 427 present today) and just after 1:20 p.m. ET he passed that mark. As expected, the voting was partisan — former House Speaker Nancy Pelosi received solid support from her fellow Democrats, who are in the minority in the House. Also as expected, Boehner didn't get the votes of some of those conservative critics. But in the end, he was reelected on the first and only ballot and will again lead his party in the House. Republicans control the House, with a 234-199 advantage in seats (there are now two vacancies). Democrats, with the help of two independents, have a 55-45 edge in the Senate. As expected, Republicans have again chosen Rep. Eric Cantor of Virginia to be majority leader and Democrats have again chosen Pelosi to be minority leader. As he finishes his remarks, Boehner says "there is a time to every purpose under Heaven. For the 113th Congress, it is a time to rise. When the day is over, and the verdict is read, may it be said that we well and faithfully did our duty to ensure freedom will endure and prevail." Choking up a bit again, Boehner tells House members that "if you have come here to see your name in lights or to pass off political victory as some accomplishment, you have come to the wrong place." "The door is right behind you," he adds, pointing to the rear of the chamber. Boehner is now addressing the House. Famous for showing his emotions, he chokes up a bit at this point in his remarks: "We are sent here not to be something, but to do something. ... Or as I like to say, to do the right thing." -- Boehner received 220 votes. -- 10 other people received a total of 14 votes. -- There was one "present" vote. So, Boehner needed at least 214 votes, it appears (a majority of the 427 members present) and got six more than that. "It is an honor to serve with @SpeakerBoehner. I look forward to continue working with my friend to help all Americans." 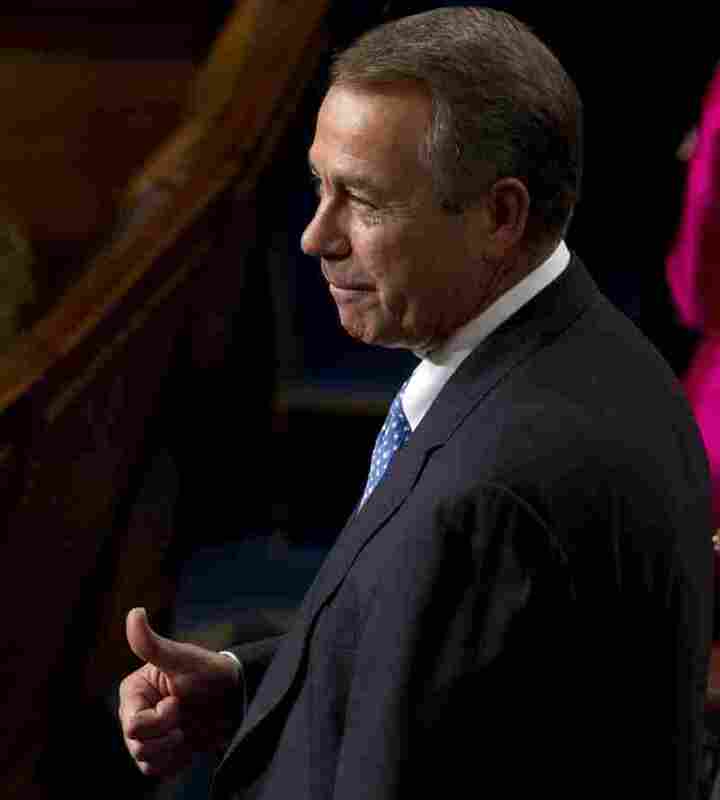 A thumbs-up in thanks: Speaker John Boehner, R-Ohio, on the floor of the House today. The tally for the speaker just now stands at 219, according to the score being kept by C-SPAN. There have now been six "present" or "protest" votes for someone else. Former Rep. Allen West, R-Fla., has gotten two. He's a Tea Party favorite. Though no Republican's name was put forward to oppose Boehner, there have been a few "present" votes or votes for others. Rep. Paul Labrador, R-Idaho, has gotten a vote. So has former Secretary of State Colin Powell (you do not have to be a member of the House to be elected speaker). The clerk just asked if there are any other nominations. There were none. So, Boehner is not being directly challenged from within his party. That means — unless things have turned upside down — he will be reelected speaker. Earlier, Rep. McMorris Rodgers said he had the unanimous support of the GOP conference. Though Democrats don't have the numbers to elect a speaker on their own, they do have the right to put forward a nominee. Rep. Xavier Becerra, D-Calif., just nominated former Speaker Nancy Pelosi, D-Calif.
Rep. Cathy McMorris Rodgers, R-Wash., just put the speaker's name forward.